Three local high school basketball teams concluded play Saturday in mid-winter tournaments. Columbia (10-9) dropped all three of its games in the Chick-fil-A Classic at Belleville East. The Eagles fell to a tough St. Mary’s squad on Wednesday, 70-51, despite leading 9-5 after one quarter. St. Mary’s came alive on offense to go up 30-19 at halftime and took hold of the game from there. Jordan Holmes and Jon Peterson scored 13 points each to lead the Eagles. On Thursday, the Eagles dropped at 51-44 contest to Belleville East. Columbia shot 53 percent from the floor for the game, led by Peterson with 16 points. Columbia took Alton to overtime on Saturday but dropped a 64-56 contest. Holmes scored 29 points in the loss. Following two narrow defeats to quality teams earlier in the week, Gibault (5-15) picked up victories in its final two games of the Okawville Invitational Tournament. The Hawks edged Madison, 70-68, on Thursday despite trailing 23-11 after one quarter. Gibault outscored Madison 28-15 in the fourth quarter to pull out a win. Karson Huels led the Hawks with 22 points, followed by Josh Besserman with 21 points. The Hawks ended tourney play with a 66-58 win over DuQuoin on Saturday. Huels again led the way with 18 points, followed by Logan Doerr with 15 points. Waterloo (5-14) wrapped up play at the Sparta Mid-Winter Classic with a 1-3 record. 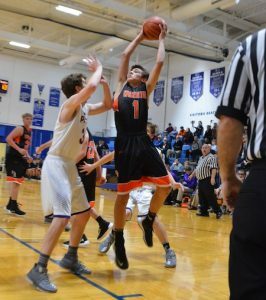 Following a Tuesday loss to Sparta, Waterloo dropped a 56-50 game to Trico on Wednesday. The Bulldogs led 24-19 at halftime but couldn’t hold on. Trico outscored Waterloo 18-9 in the fourth quarter. Ross Schrader scored 20 points and grabbed 10 rebounds to lead the Bulldogs, who lost to Murphysboro on Friday night, 62-52. On Saturday, Waterloo defeated Red Bud in the seventh place game, 46-33. Eli Dodd scored 14 points to lead the ‘Dogs, who were facing their former head coach in CJ Cruser, who is now at the helm of the Musketeers. In non-tourney action, Dupo has reeled off three straight wins following an 0-15 start. The Tigers crushed Marissa on Tuesday, 47-27. Kyle Steinhauer led Dupo with 13 points, followed by Malik Calhoun with 12 points and Kolbie Allen with 10 points, 11 rebounds, four steals and four blocks. On Friday, Dupo won at New Athens, 56-51. Steinhauer scored 15 points and Allen added 13 points for the Tigers. 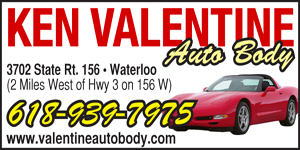 Valmeyer (10-10) won at Father McGivney on Friday night, 51-33. The Pirates outscored Father McGivney 31-16 in the second half. Philip Reinhardt led the way with 23 points for the Pirates, including five three-pointers. Michael Chism added 13 points and 12 rebounds.